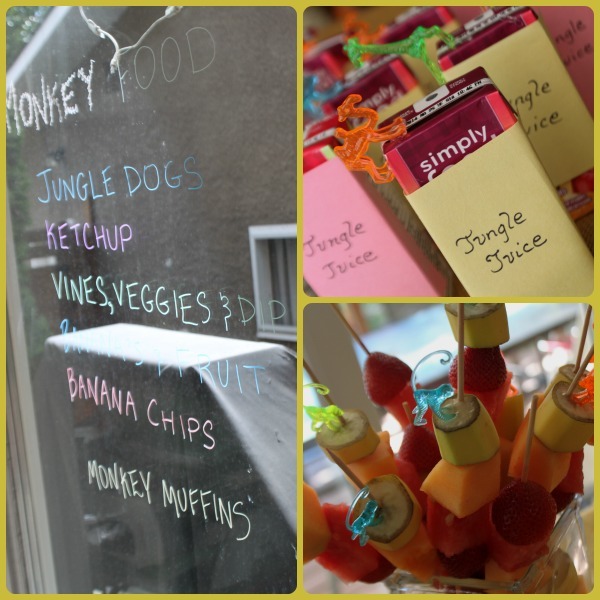 I decided to change things up this Sunday and just post some of the party/food/theme highlights from my daughter's MONKEY BAR Birthday party. Not doing a full week in review showing you all the clean meals we ate. Hope you don't mind. So this week is all about our party. I have a bit of a THEME party addiction - no thanks to Pinterest. And now both my girls do too. Its causing some issues because 6 and 4 year old's have trouble picking ONE idea. My 4 year old now wants a Wedding, Valentine, Hello Kitty, Monkey, Hula-hoop, Skipping, Hotel Party. Luckily her birthday isn't until April so we have some time to narrow it down. My oldest daughter turned 6 this week. SIX. Going into grade one. And we live across from the a school/playground. And she is slightly obsessed with doing MONKEY BARS. So we decided to have a monkey bar party. 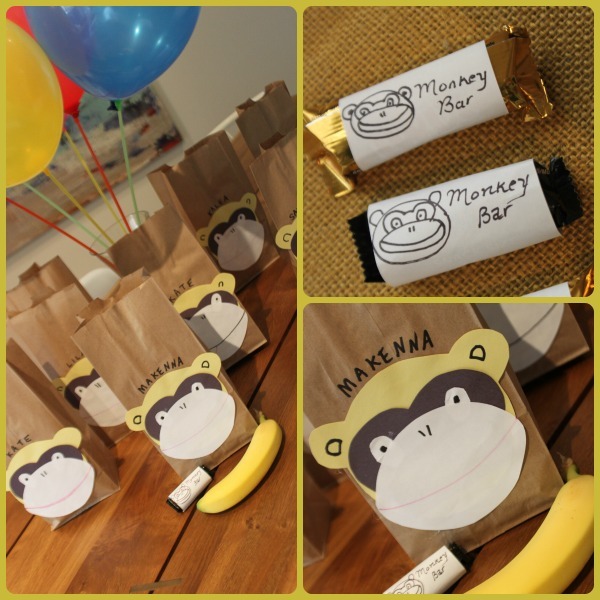 Which kind of turned into a Monkey theme party. And I am currently quite obsessed with saving money and thrift stores. So of course I had to do the party on a dime. Which meant my trusty glue gun was out in full force. We had 12 kids plus baby at the party. We hosted it at our house (i.e. too cheap to go off-site). The kids played in the backyard, had dinner/cupcakes and then we headed across the street to the playground for some playing, swinging and monkeying around. We had a skipping challenge and we brought chalk and water so they had a blast decorating the concrete. And we opened presents. Lots of presents. Overall, it was a great day. The best part was that my darling daughter was happy..........and confident...........and relaxed. And having fun. A year ago her immune system was completely out of whack and she had a terrible time at her own party. She cried for about 75% of it. You can go back and read her story HERE if you want the details. Long story short we have changed her diet to eliminate her food sensitivities, put her on some supplements and try our best to keep her in a routine and she is thriving. To be honest I was pretty nervous before the party - its so much work sending invites and baking/cooking/gluing and I was really worried she might shut down again. And we might have to put an end to our Birthday bashes or make them really small events. But she sailed right through it and already "can't wait for her next party". Now that my daughter has to eat egg, gluten and diary free (or as close to that as possible) we can't really run down to the local grocery store and buy a cake. So once again I did my modified version of the Betty Crocker Gluten Free Cake Mix. I replaced the eggs with Chia gel and used coconut oil instead of butter. For an icing I used a Betty Crocker Low Fat Chocolate Icing that's gluten free. It has "milk ingredients" but they are about the 10th item on the ingredients list and it is gluten and egg free so I went for it. 1) Version one - I found a big bag of plastic animals (including numerous monkeys) at the thrift stores. I bought some candy banana's at the Bulk Barn. Yes - we picked through the assorted fruit candies to just take the banana's. Shoot me. 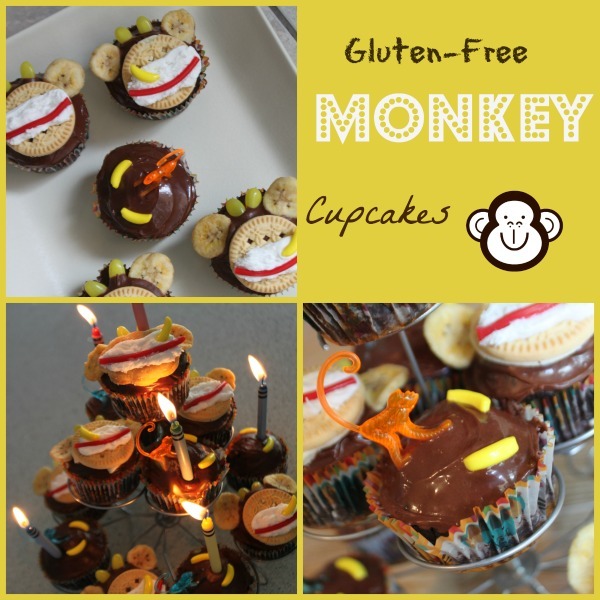 These were the totally egg and gluten free version. 2) Version two - I used Glutino Vanilla "oreo" cookies for the face, banana chips for the ears, white icing and licorice for the mouth and yellow jelly beans for the eyes. The cookies were not actually egg and diary free but they everything was gluten free. The kids all seemed to enjoy them. And the birthday girl LOVED them so I'd say they were a success. Decorating was a bit labor intensive but the cake is my first priority when planning a birthday party so there is no way around it. I'm lovin' my kids new Crayola Window Writers. I put the menu on my kitchen window which helps me stay organized. Fun. We had nitrate free hot-dogs. A special treat: Ketchup - our house just recently went Ketchup-free so this was a big deal for my 4 year old. Veggies and dip, Fruit Kabobs and assorted fruit, banana chips, GF Pumpkin seed nacho chips and Jungle Juice. Yep - my glue gun came in handy for the pimping out the juice boxes. A simple menu that was fairly clean. For a birthday party. For the loot bags I got the glue gun out again. And lots of construction paper. This is where my cheapness really shines through and causes hours of unnecessary labor time. But I thought they turned out cute. My first attempt looked more like a bear than a monkey - which the girls were more than happy to point out. The kids all went home with a banana (of course), a piece of licorice, a "monkey bar" and one little toy. The loot bags probably cost me about $.50 each....................obviously not including labor costs. I don't want to throw off my cost/benefit ratio, or give my rational and reasonable hubby any ammunition to say "put down the damn glue gun and just go buy something"
So you can do a cute little clean"ish" theme party on a dime. Frankly............6 year old's don't really give a damn about the theme so you probably don't need to waste your time. Unless you are a little crazy like me and you just can't stop yourself. At least I know I'm acting crazy and cheap. I can't stop it but I recognize it. And since its Sunday one quick update on my Candida diet.......................I am struggling along - its been almost 4 months now. If I cheat at all I have a flare, regroup and have to go through some unpleasant die off symptoms. And I'm hungry ALL THE TIME. Even after a huge meal. Plus I have been having some pretty bad digestive distress. Its very frustrating after 4 months on this diet. In addition to my occasional pity party, I have been doing LOTS of research on leaky gut and other diet and supplement options. And spinning in circles a bit to be honest. I am just wondering if starving the Candida with the Candida diet is a band-aid solution for a symptom of a bigger problem; leaky gut. Anyway - more on that another time. Don't want to give you the impression that I'm not feeling good. My good days still far outweigh my bad days. I still feel like I'm making progress on my journey of healing my gut. But I'm just foreshadowing that my idea of CLEAN eating and list of legal ingredients could very well change again in the near future..............stay tuned.